An endotracheal tube is a flexible plastic tube that is placed through the mouth into the trachea (windpipe) to help a patient breathe. The endotracheal tube is then connected to a ventilator, which delivers oxygen to the lungs. 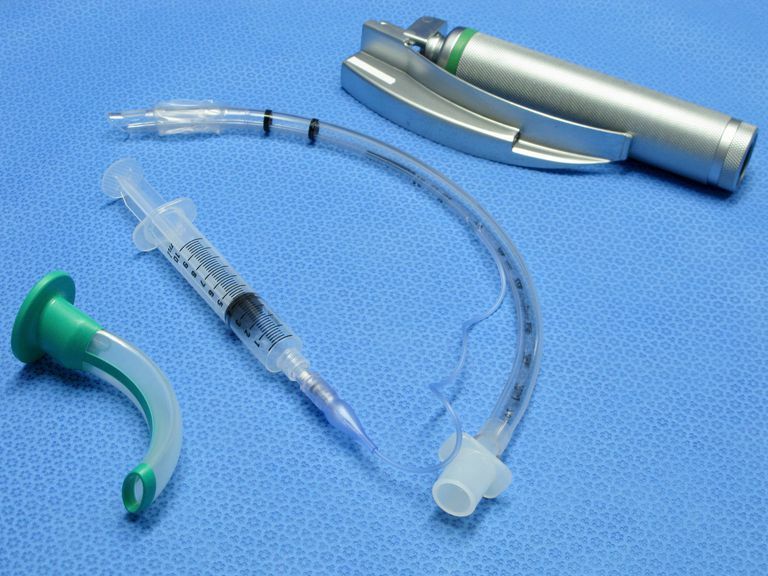 The process of inserting the tube is called endotracheal intubation. For general surgery - With general anesthesia, the muscles of the body including the diaphragm are paralyzed, and placing an endotracheal tube allows the ventilator to do the work of breathing. To remove a foreign body - If the trachea is obstructed by a foreign body that is aspirated (breathed in) an endotracheal tube may be placed to help with removal of the foreign object. To protect the airway against aspiration - If someone has a massive GI bleed (bleeding in the stomach) or suffers a stroke, and endotracheal tube may be placed to help prevent the stomach contents from entering the airways. To visualize the airway - If an abnormality of the larynx, trachea, or bronchi is suspected, an endotracheal tube may be placed to allow careful visualization of the airways. After lung cancer surgery - An endotracheal tube connected to a ventilator may be left in place to help with breathing after surgery. To support breathing - If someone is having difficulty breathing due to pneumonia, a pneumothorax (collapse of a lung) heart failure, or unconsciousness due to an overdose, stroke, or brain injury, and endotracheal tube may be placed to support breathing. Often an endotracheal tube is placed when a patient is not conscious. If a patient is conscious, medications are used to ease anxiety while the tube is placed and until it is removed. The tube is placed through the mouth (or sometimes through the nose) after moving the tongue aside, and threading the tube down between the vocal cords into the trachea. Due to its location, individuals are unable to talk when the tube is in place. Pneumothorax (collapse of a lung). Esophageal placement - An x-ray may be done to make sure that the tube is placed in the trachea and not the esophagus. National Library of Medicine. MedlinePlus. Endotracheal Intubation. Updated 11/14/14.